I received an email from a visitor to my website asking if I could provide him with any information on the charm shown here. 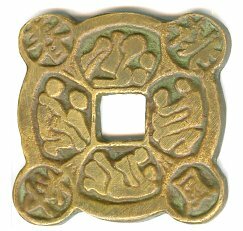 Chinese Love Charm with Inscription from "Song of Unending Sorrow"
Charms of this type are actually fairly common. The charm is modeled after this charm discussed in detail at Chinese Marriage Charms. The four Chinese characters at the “corners” of the charm are taken from a poem written by Bai Juyi (772-846 AD) who was a very famous poet of the Tang Dynasty (618-907 AD). The poem is entitled “Song of Unending Sorrow” or “Song of Everlasting Regret” and describes the great love of Emperor Xuanzong (685-762 AD) for his beautiful consort Yang Guifei, and his deep sorrow upon her death. The Chinese characters on the charm are as follows. The character at the upper left is “spring” (chun). The character at the lower right is “wind” (feng). The character at the upper right is “peach” (tao), and the character at the lower left is “plum” (li). The inscription is read in the same order as “spring, wind, peach, plum”. These are the first four characters of a line from the poem which translates as “Gone were the breezy spring days when the peach and plum trees were in bloom”. Yang Guifei is considered to have been one of the most beautiful woman in Chinese history and is known as one of the Four Beauties. A different charm with an inscription that refers to this love affair is discussed here. I had not seen this particular charm before and have not been able to find it in any of my reference books. I am not even sure it is Chinese. It could be Korean, Japanese, Taiwanese or Vietnamese. Also, based on the image, I do not think it is “old”. My guess is that it was privately cast sometime during the 20th century.